Merry Christmas, everybody! It's that time of year again. Folks are out shopping, houses and trees are decorated, and Sara is wearing her maternity pants to make room for all of that holiday comfort food. The difference this year is that she's actually pregnant this time. With a baby on the way, we knew we couldn't continue the "Lonnie, Sara, Coyle, and Kiddie's Amazing Magic Hour of Wonder Hour" magic show. To add another name to the marquee would have meant that we would have to pay for the extra letters. When you're cheap like us, you'd rather make a radical lifestyle change than pay for a few letters on a sign. It's just common sense. Besides, Sara's "ta-da" gesturing was getting out of control. Normally, we swing from one idea vine to the next. Homemade LASIK surgery to Marching bands to becoming Amish to traveling Magicians. Just a series of completely logical steps. But, what comes after magic? Nobody knows. We had no idea what to do next. Expecting another baby with no magic show to put food on the proverbial table. Then this summer, Sara had a dream. She dreamt that she was at her "girl" doctor for an appointment about the baby. So, there she was in her tissue paper princess dress when she said "Doctor, our life as a magical family is over. What do we do now?" 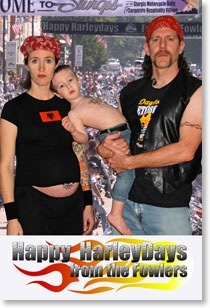 And as the emotion welled up inside her, the doctor gently said, "Sara - you and your family should start a biker gang." Then he climbed back onto his unicorn and had to go meet Mr. T for olympic bowling tryouts. Some folks say this is a crazy dream. But, the important thing is that it's our dream. The Fowler Family dream. 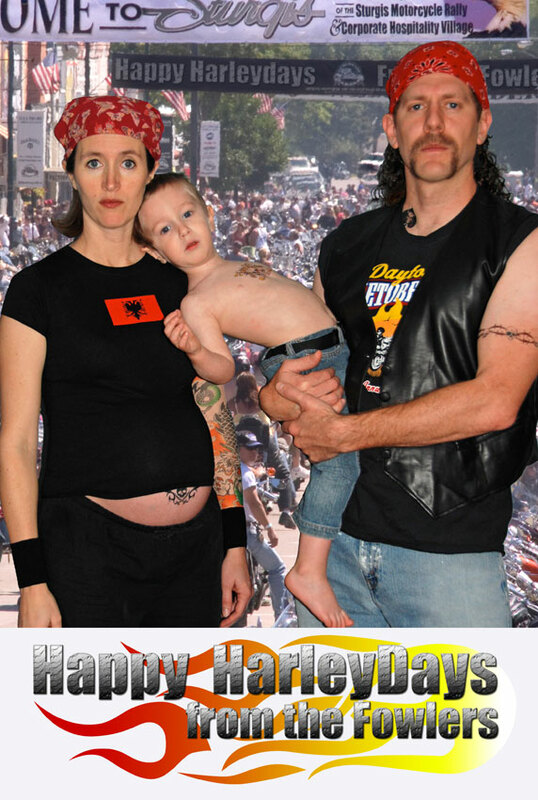 The one that we can finally achieve - family biker gang. We can't underestimate the importance of seeking the advice of a medical professional. It is an invaluable thing to do. Or do we mean valuable? Achieving a lifelong dream in the span of a couple months isn't easy. In fact, we still have to work hard everyday toward "living the dream". For example, we haven't designed a gang logo yet. And we still need motorcycles. As we shut this year's update down, we'd like to leave you with some inspirational words from the most notorious biker band of all time, Rascal Flatts. "We live to ride. We ride to live. Me and my gang. Na na. Na na na na na. Na na na na na na." • We shot this picture in our living room, where most of our photos have been taken. • It was very difficult to get Coyle to cooperate with us on this photo. However, when he did look at the camera, we got this photo and it was perfect. • Us having tattoos for the photo was the seed that sprouted the biker gang idea.